Months from now, when I look back at our time in Barra de Navidad, I already know I’m going to have a silly grin on my face. This place is our cup of tea, it’s the bee’s knees, and it’s definitely the cat’s meow. But before you book your next vacation here, I should give you some context. While you’d certainly have a grand time in this Mexican paradise (in fact, it’s crawling with Canadians on vacation) we have to admit that Barra has a special appeal to cruisers. You know… those people who make it look like every day is a vacation, but are really just travelers searching for a nice place to fix their floating home while constantly checking the weather. The days we enjoy as tourists or beachgoers are a treat for us, too. And while Barra has those joys, that’s not entirely why we’ve become its biggest fans. It starts with the geography: Barra is not just another pretty bay. For boaters, it offers exceptional protection from the ocean swells. There is a beautiful crescent-shaped white sand beach, perfect for long walks and beach days. And while you can anchor there, that’s not what most boats choose to do. 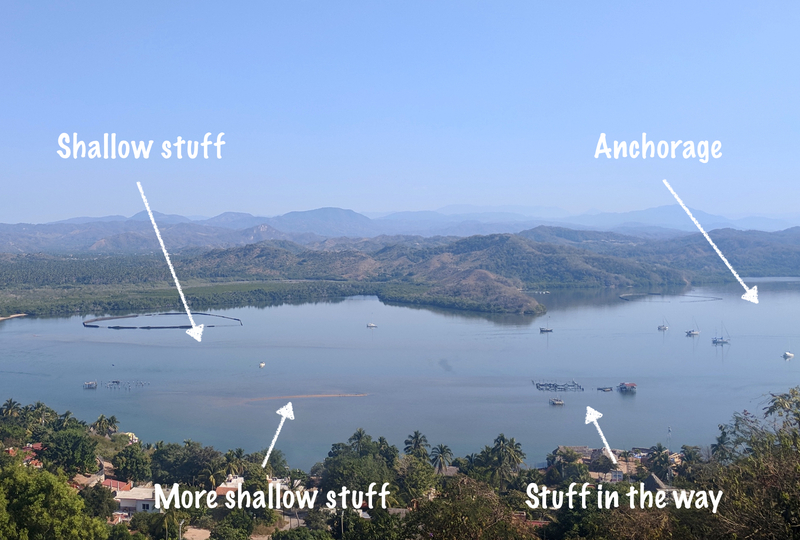 Tucked into a corner of the bay, boats cross a shallow sandbar (hence the name “Barra”) and pass the breakwater that leads into a completely enclosed lagoon. 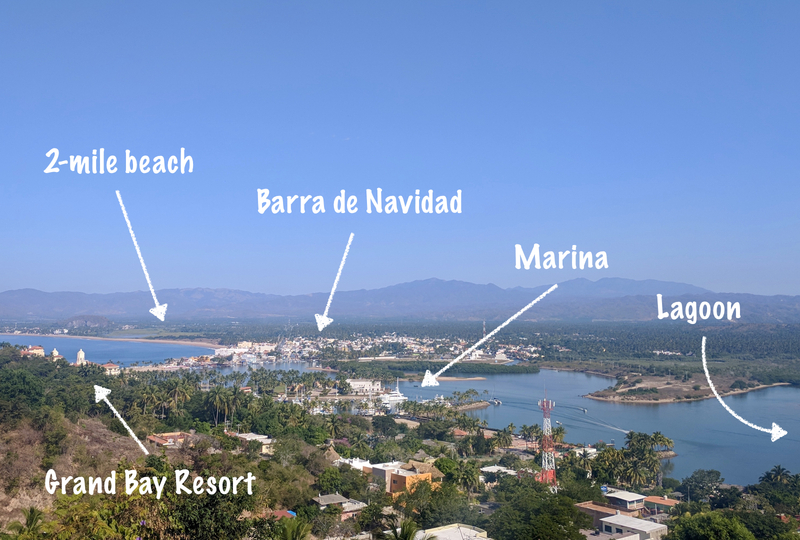 Once inside, you pass the town on your left, and see that Barra de Navidad is actually on a peninsula. It’s the town’s backside—facing the lagoon—that reveals its true charm, with docks, restaurants, homes, and a fish market built right down to the water. Across the channel is the Grand Bay Resort (more on that later) and the marina. Further down the channel, past the marina, is where the fun begins. The entrance to the lagoon anchorage is extremely narrow and less than 15 feet deep, with shoals lining each side. Oh, and the narrow channel is unmarked! It’s common for boats to touch the muddy bottom or even get stuck aground (temporarily) if they veer a few feet out of the channel. Luckily, we were not one of the boats that ended up in the mud. 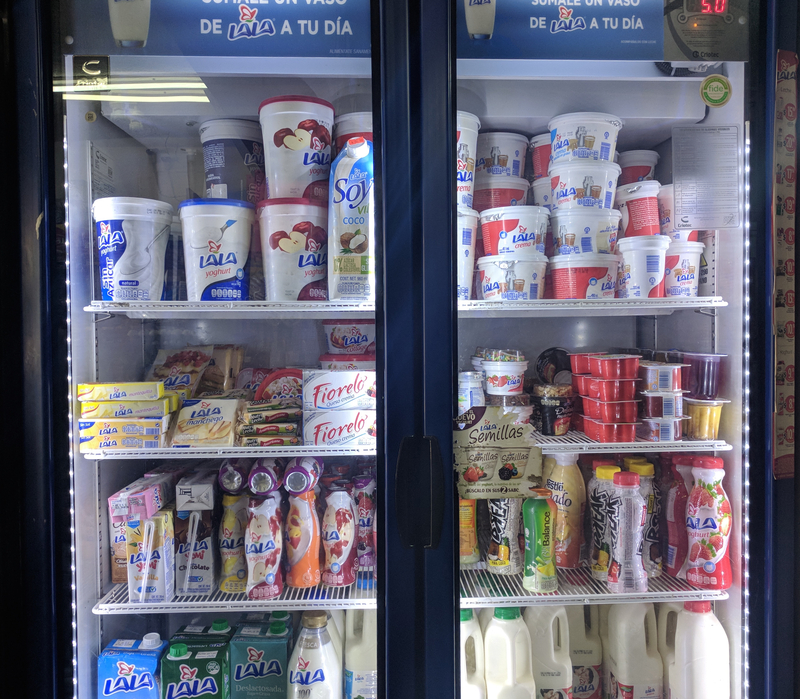 Our own entrance was a bit stressful, for sure, but a few minutes after anchoring we were already experiencing the cruising comforts of Barra de Navidad. It starts with The Lagoon Anchorage. For the first time since leaving San Francisco, we are in an anchorage that is completely protected from the ocean. Guys, there are no swells—the sandbar keeps them at bay. No rocking and rolling when we’re trying to make dinner, work on the computer, or sleep. The boat stays completely still. It’s a dream come true. I’m actually a little scared to go back out there now that I remember what it feels like to be in a boat that isn’t moving. And then, when we wake up from a blissful night of sleep, do you know who shows up? The French Baker. Yeah, seriously! We’ve been looking forward to this for weeks. Every morning at 8:30 we hear a welcome voice on the VHF radio: “Good morning, zis is your French bakerrr.” (Yes, you should read that out loud with a French accent.) The radio buzzes with orders as the baker makes his way through the marina and then the lagoon. 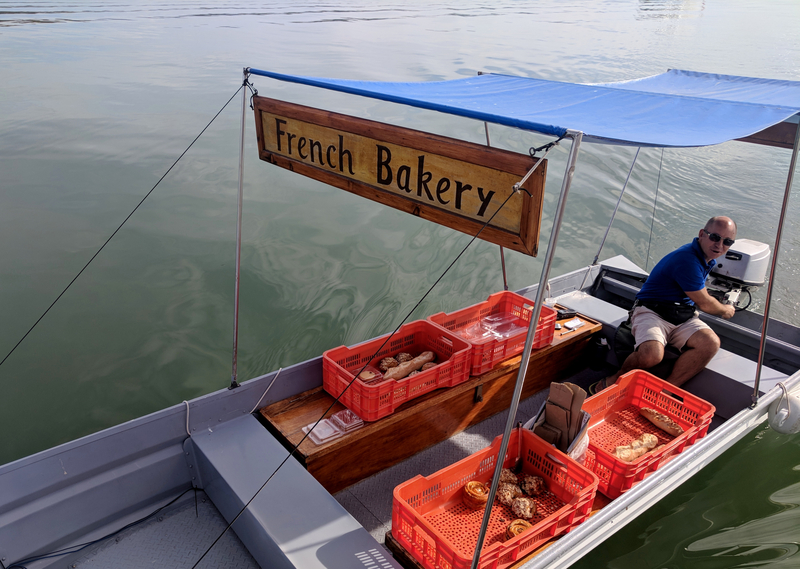 For less than $10 we get a fresh almond croissant, a pan au chocolat, and a veggie quiche delivered right to the boat. When we’ve had our fill of delicious pastries, it’s time to head into town. Do we launch the dinghy, braving a questionable surf landing and hoping we make it ashore without getting soaked, accepting that our feet will be covered with sand but going anyway? Nope! But here in Barra, a call to “Taxi Aquatico” on the VHF radio brings a panga alongside our boat within five minutes. At $4 roundtrip for both John and me, it’s a no-brainer. And the taxis run 24/7, so we can enjoy a little nightlife on shore stress-free. 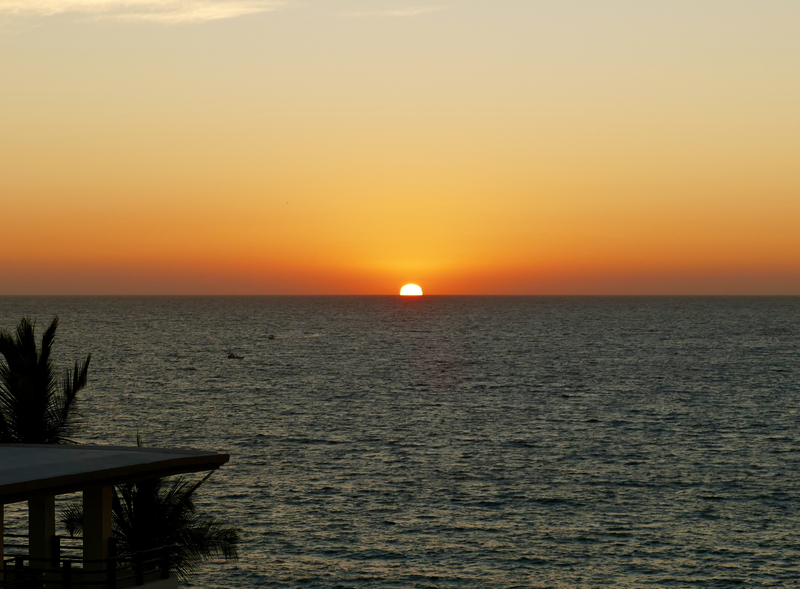 Nighttime in Barra begins with spectacular views of the sunset. Since leaving Sausalito, we’ve watched the sunset just about every night. But there’s something different here. From the lagoon, we can watch the sun slide behind the resort and cast warm light on the town. 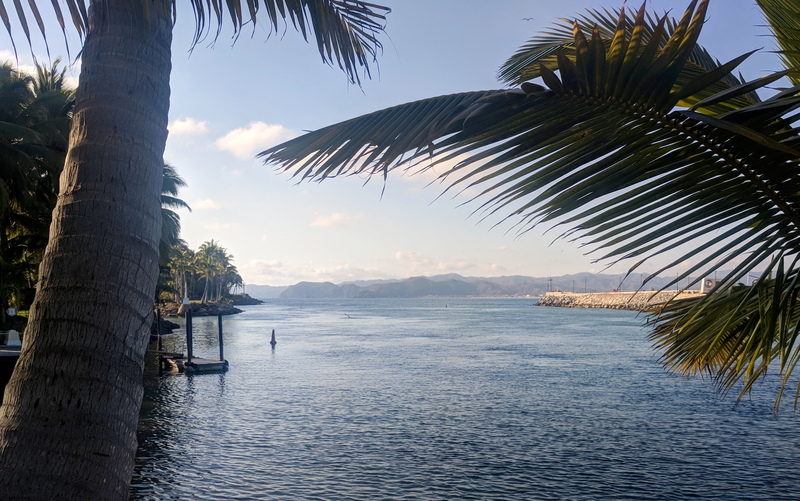 Or we can hop in a water taxi, walk two blocks, climb four flights of stairs, and watch the sunset from the rooftop bar at the Hotel La Alondra. It’s just magical. Then, Barra comes alive after dark. Like so many other places we’ve been in Mexico, evening—after the afternoon heat is gone—is when the town is most energetic. Every restaurant is open. The shopkeepers come back from their siestas and the tiendas (small markets) stay open late. Street-food vendors appear everywhere. Even the salon is open. The daytime is pretty sleepy, so you need to be out and about in the evening to really enjoy this little town. But we returned at 8pm to find the window swung open, revealing an inviting bar. Lights decorated the outside of the building, and three long tables were colorfully decorated, set up on the sidewalk and street. This restaurant seats about 20, and all the chairs were taken. The kitchen, which is actually down the street, was bustling. Unfortunately none of the “after” photos I took turned out. You’ll have to trust me. I only had one michelada, I swear! 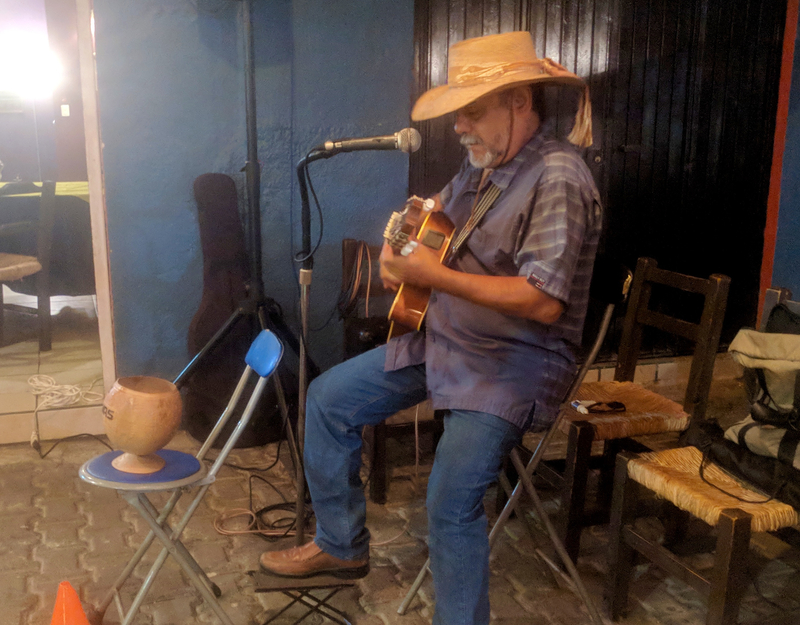 Around Barra, live music is everywhere at night. It’s usually a guy with a guitar, playing a mix of Mexican folk songs and classic rock from the 60s and 70s (for the retired gringo crowd). 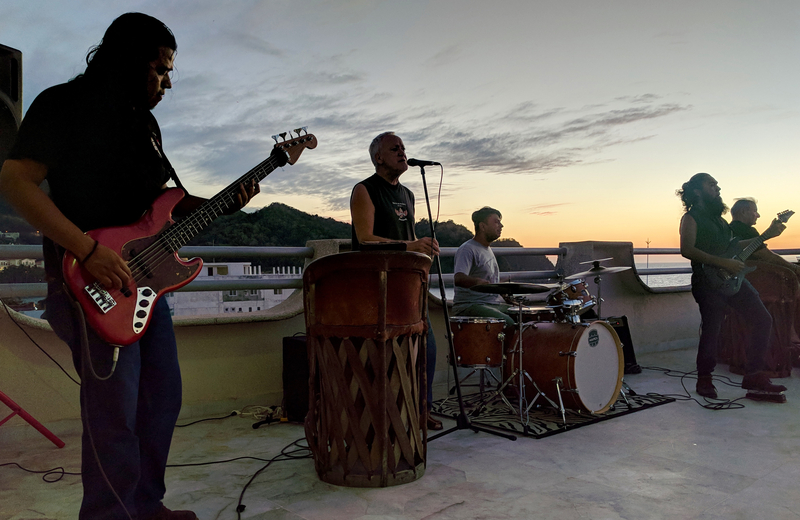 One night at the Hotel La Alondra, a proper rock band set up on the rooftop and jammed as the sun went down. And for the most part, the music is good—we particularly enjoyed the singer in his early 20s whose baritone voice filled the restaurant without amplification. Whether day or night, we love Barra’s small-town feel. The water taxi drivers started recognizing us quickly. We see the same faces when we walk down the street. There’s no highway and no commercial traffic in the harbor. With one lap around town, you can figure out where everything is, because it’s only a few streets. It might seem counter-intuitive, but we appreciate that there are no marine services or big stores in Barra. That means there are no big-ticket items to buy for the boat. 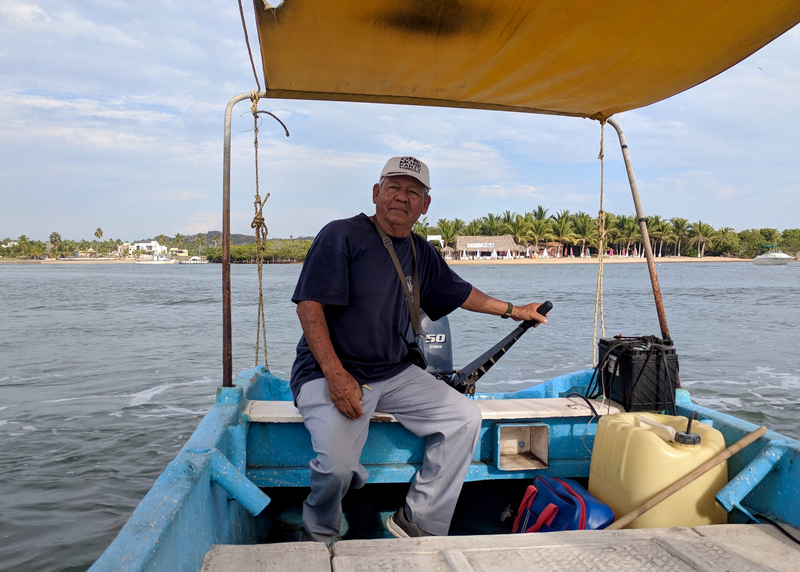 (In Cabo we bought an outboard motor and in La Cruz we had an awning made.) There’s little temptation to add things to the boat to-do list, because supplies are not available. We enjoy the required self-sufficiency of cruising, and Barra reinforces that in the most charming way. 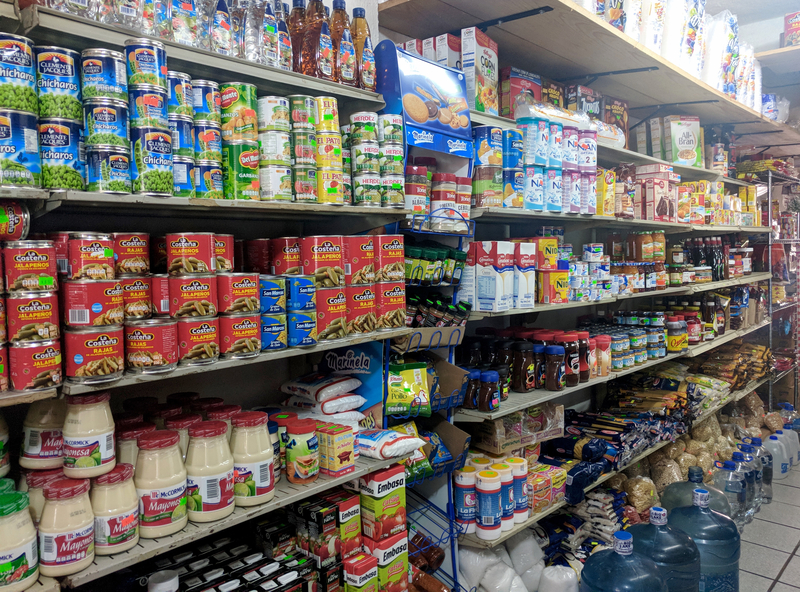 There’s not even a supermarket here, so major provisioning is out of the question—when we eat on the boat, we’ve had to pull canned foods out of the bilge and frozen stuff from the freezer, supplemented with a few fresh items from town. 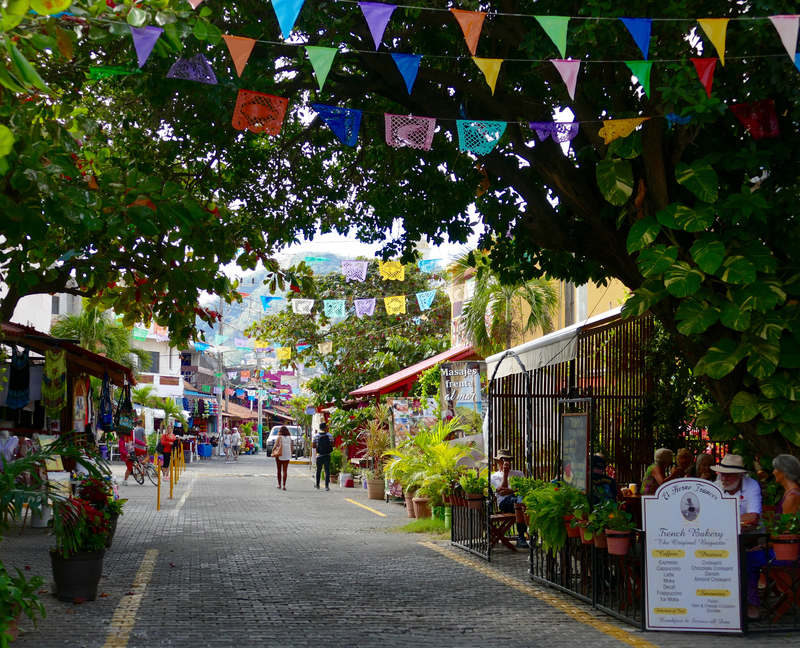 But since I love shopping for food in Mexico, we did check out all three tiendas in town to see what we could find. 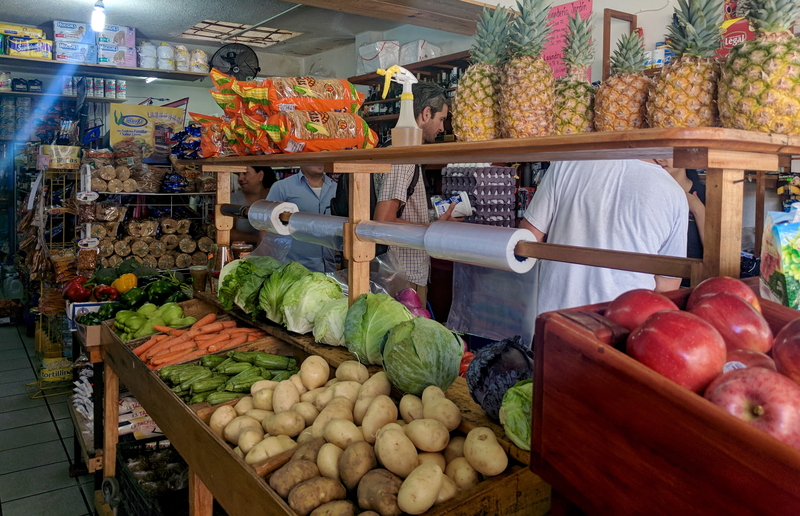 We picked a favorite shop, and that’s where we’ve topped up on fresh limes, avocados, bread, and yogurt. And the produce section. See John waiting in line to buy some yogurt? Any description of Barra would be incomplete without mentioning the Grand Bay marina-resort complex. Towering above the water, it’s the major landmark on the south side of the bay. And for cruisers, it offers a dose of incredible luxury for the (relatively low) cost of a docking fee. After several days in the lagoon, we came into the marina to service the diesel engine and clean the exterior of the boat. But in addition to the usual conveniences—showers, laundry, and electricity (which means I can blow-dry my hair! )—the marina provides access to the resort amenities! That means pool time with frozen drinks! It’s such a treat to cool down in the pool after doing sweaty boat chores or returning from a hike in the hot sun. 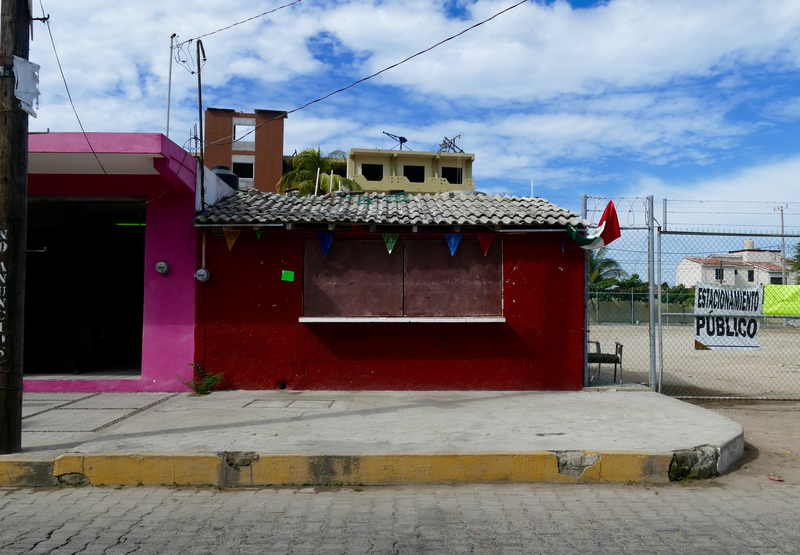 We still have a bunch more stops in Mexico, but I know that Barra will stay near the top of our “favorite places” list. Lucky for us, a weather system (with rain, thunderstorms, and contrary winds) moved in and convinced us to stay a couple more days. And that gave our friends on Salt a chance to catch up. So we’ll be enjoying the comforts of Barra de Navidad, in good company, for just a little bit longer. Michelle – I love your blog! What a nice escape to read about your travels while I sit in my BMRN cubicle (at least I have a very nice view of Mt. Tam from my space). Enjoy your adventure – it looks fabulous! Hi Dominique – It’s nice to know you are reading! Thanks for your message. We definitely miss our routine on land, but this “office” definitely has it’s perks. Take care! El sol parece mas brillante mientras ustedes dos tienen divertida en este playa hermosura. Que bueno. Me gusta todos sus cuentos! Suzie! It was gray and rainy where we were for a few days and then the day after I read this the sun came out – seriously! If I had known you spoke Spanish this well we’d have taken you with us! Michelle and John, Bob McEligot connected us to your blog. Please put us on your list. We love reading about your cruising adventures. We are glad you are having such a great time, but we miss you around the club and at Tinsley. Hi Bruce and Lynne – we miss you too! So glad you are reading. John also wrote an article for the March edition of the Mainsheet and mentions you! Hope you are both doing well.